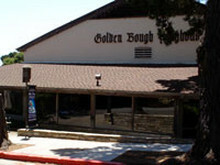 The Golden Bough Playhouse is the home of Pacific Repertory Theatre, the only professional theatre in Carmel and all of Monterey County. 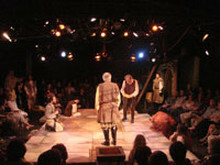 The playhouse features two different theatres: The 300-seat proscenium style Golden Bough Theatre that is used for musicals, and larger classical and contemporary performances, and is accessible from the main lobby entrance on Monte Verde Street entrance; and the Circle Theatre, a 120-seat theatre-in-the-round, ideal for experimental works and other performances that are enhanced by an intimate setting, located in the lower, rear section of the Golden Bough Playhouse, accessible through its own entrance on Casanova Street, between 8th and 9th. Box Office is open Tuesday - Saturday, 11am to 4pm.